Porsche builds just five limited edition 911 Carrera GTS B59's to celebrate Hurley Haywood's five overall wins at the 24 Hours of Daytona. 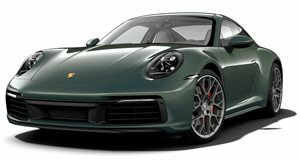 Porsche recently announced the last special edition of the outgoing 997 generation model. Called the Carrera GTS B59, it celebrates Hurley Haywood&apos;s five overall wins at the 24 Hours of Daytona. Hurley Haywood won the Daytona 24 Hours in 1973, &apos;75, &apos;77, &apos;79, and &apos;91. The GTS B59, not surprisingly, will feature plenty of styling upgrades. Starting under the hood, the B59 generates power from a 3.8-liter flat-six delivering an output of 402hp and 310 lb-ft of torque. It accelerates from 0-62 mph in 4.4 seconds and has a top speed of 190 mph. The exterior features a Red/Blue stripe design for the front hood and rear deck with 19-inch Sport Classic Wheels. The interior includes Carrera White painted accents in addition to Adaptive Sport Seat Backrests and door entry guards in stainless-steel with a "Hurley Haywood" engraved signature. Also included are heated front seats, sports suspension with a limited slip rear differential lock, sport shifter, and a sport chrono package. The 911 Carrera GTS B59 will be limited to just five units, each costing $133,540.